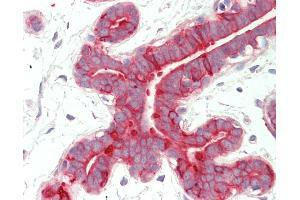 Anti-KRT18 / CK18 / Cytokeratin 18 antibody IHC staining of human breast. Immunohistochemistry of formalin-fixed, paraffin-embedded tissue after heat-induced antigen retrieval. Antibody concentration 5 ug/ml. Specificity Human KRT18 / Cytokeratin 18. Reported variants represent identical protein: NP_000215.1, NP_954657.1. Immunogen Synthetic peptide C-EELDKYWSQQIE from an internal region of human KRT18 / Cytokeratin 18 (NP_000215.1). Percent identity by BLAST analysis: Human, Chimpanzee, Gorilla, Gibbon, Monkey, Mouse, Rat, Ferret, Bovine, Bat, Elephant, Panda, Rabbit, Horse, Pig, Guinea pig, Xenopus (100%), Platypus (92%). Usage: Peptide ELISA: antibody detection limit dilution 1:32000. Western blot: Approx 48kD band observed in lysates of cell lines A431, HeLa, MCF7 (calculated MW of 48.1kD according to NP_000215.1). Recommended concentration: 0.1-0.3 μg/mL.